In just about every home, the kitchen is the room that receives the most traffic. With more traffic, comes more mess; the larger family, the larger the mess! Thus, one struggle that many families battle with is keeping the kitchen clean and organized. Keeping the busiest room in the house in order is not as tough as you think. Some strategies will take a little more time than others to complete, but the reward of a freshly tidied kitchen will be well worth the effort. Additionally, you can earn some money with a little extra work! Bring organization to your kitchen cabinets with the following eight steps! 1. 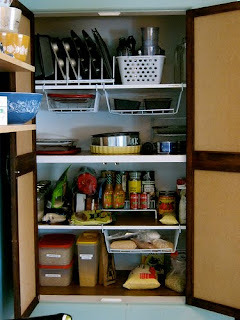 To streamline your kitchen activity, put dishes and other items in cabinets close to where they will be used. For example, cups should go by the refrigerator or sink and baking sheets near the oven. This sounds simple, but the idea does evade some people’s minds. The advantage of this strategy is lowering the amount of effort it takes to accomplish a task and decreasing work times when cooking and preparing meals. 2. On a related note, if you have children who are able to help themselves to food and drinks, but are not old enough to use adult size dinnerware and flatware, put their special dishes in an area within their reach. This will allow them to be able to fix their own snacks and complete simple tasks without your assistance. This is a good way to teach them about personal responsibility! 3. Families often have dinnerware used every day and some only used for special occasions. It is wise to separate the special and everyday dinnerware and flatware. The special items can be placed in less accessible areas because of their less frequent use. On the other hand, the everyday items should be placed near their usage areas. 4. 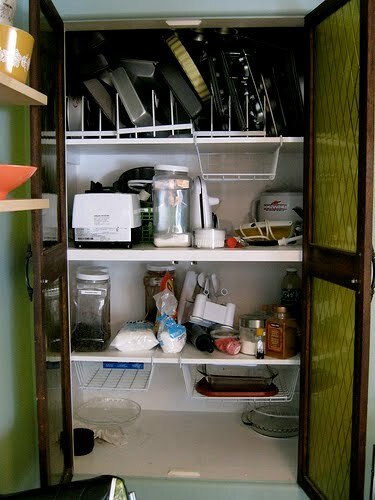 Kitchen items that are not used very often at all, like cookie cutters or specific-use appliances, can also be placed in spots that area less accessible. For example, cabinets or drawers above the refrigerator, below the stove, or the tops of shelves are great places for these items. 5. Try to free up as much space as possible. This will allow you to stay organized and remain clutter free. Go through your kitchen items and sort what you do need from what you do not. Obviously having 36 drinking cups is a bit too much. So, keep one set in addition to a couple of your family’s favorites. Also, decide what countertop appliances are absolute necessities. The toaster, blender, and coffeemaker are the dominant countertop appliances and nothing else in the kitchen replicates their function. Others, like a popcorn maker, quesadilla maker, or Panini press, may be unnecessary for your family and can be removed. Unwanted dishes, flatware, and appliances that are still in good shape can be sold at garage sales or on Craigslist. Craigslist has a low learning curve and can be very efficient for getting rid of your unneeded items. You can price these items to sell quickly or to try to sell at their current value. You might think no one wants your items, but you will be surprised. Check what other items are going for in order to help find a correct price point. I found it works best to provide my cell phone number on the site because it is much easier to discuss the details over a phone call than an email. 6. All items in the pantry should be checked and reviewed every few months. Throw away all items that have expired long ago. Normally, items can still be eaten a little past their expiration date so make an effort to eat those items after their discovery. You can try to clear out your pantry by looking for recipes that use a few items that you have large quantities of. An easy goal that provides fast results is to require each family member to eat one or two items out of the pantry per week. In order to save money, make note of what was not eaten. This will alert you to what your family does not want to eat and what you can save from purchasing it in the future. 7. The kitchen countertops and table often end up as a go-to place to set all random mail, papers, and household objects. Keep these areas clean and clutter-free by having designated areas for certain objects. For example, new mail can be placed in a basket instead of strewn across the kitchen table. 8. For commonly used cleaning items, create one designated area to store all items. At my house, we used to have items in the laundry room and under the kitchen sink; this made it a hassle to try to find a required item. Instead, pick one area to store cleaning products so you always know where to easily find them. You can also create a utility caddy that has the basic items in one place: paper towels, rags, window, bathroom, and countertop cleaner, scrub brush, et cetera. With this strategy, you can tackle any messy situation and know that all your tools are within reach. About the author: August Drilling works for CliqStudios.com, an online site for affordable kitchen cabinets, and loves advertising, marketing, entertainment, and a clean and organized life. Special thanks to Christaface for their photos.